Glolgster…not your ordinary poster project. Thanks to a very unwelcome visit from the stomach-flu fairy, I missed yesterdays Tech Tuesday posting :-(. So this week I am presenting Tech Tuesday on Wednesday! Everyday I have teachers ands tudents asking me about technology tools for class presentations. They are eager to move beyond the traditional stand-and-present poster project or click-and-read PowerPoint (this makes my heart happy). Today I present Glogster, an interactive poster creator. Gloster allows the creator to create a mash-up of video, images, text, and graphics to create a virtual poster. View the VoiceThread tutorial below for a basic introduction of the educational version of glogster (edu.glogster.com). Have you or your students glogged? Tell us about it! This entry was posted in book review, glogster, information technology, presentation, tech tuesday, VESTED. We’ve all been there. Sitting in a meeting, our eyes start to cross, ears start tuning out as another PowerPoint presentation clicks, clicks, clicks through various slides. Not that PowerPoint isn’t a terrific tool to present information, but with all of the options for today’s students to synthesize and publish information in unique ways, perhaps we should begin to consider it as an option rather than the default. Today we’re exploring a free, web-based tool that allows students to create video presentations by mixing images, videos, documents, presentations, and comments (voice and text). VoiceThread (voicethread.com) allows the user to create a project and share it with collaborators. They can then create a project together but remotely, solving the problem of when and how they will find the time and resources to create a presentation in a single file. To demonstrate the various tools and uses for Voice Thread, Here’s a VoiceThread on VoiceThread! This entry was posted in digital story, information technology, presentation, tech tuesday. Welcome to the first edition of Tech Tuesday! Each Tuesday I will post a blog that highlights technology tools for instructional use. This week, I thought we’d take some time to explore two tools that I shared with the staff at Fossil Ridge High School as part of library orientation: Prezi and QR Codes. Both of these tools have the potential to engage an audience by disseminating information through Web 2.0 tools and smart apps. Both are free (whoop!) and both are rather intuitive for the presenter and the audience. Prezi has taken the 20th century PowerPoint presentation into the 21st Century by creating a program that is web-based–enhancing accessibility for creators–and adding dynamic layers, motion, and animation to present a variety of media and information. Imagine an animated mash-up of your best PowerPoints, videos, images, and text and voila! Prezi. You might consider using a Prezi when introducing a new concept, unit, or theme (Think “view” in VESTED). Even a three-four minute “viewing” could jump start students’ natural curiousity and help to build background. Open House is coming up soon; play with transforming your PowerPoint into a Prezi to wow your parents. Using the html code, you can even embed your Prezi on your class web page to provide an engaging introduction. Students can use Prezi as a vehicle to synthesize information and create original presentations through a “mash-up” of media . Since it is online and free, access is open to all students. Students can collaborate to create the Prezi together on their own devices whether from home or at school. Prezi has also created an iPad app that allows the user to download and view shared and saved presentations. The editing feature, however, is limited and not very conducive to enhancing the presentation through the iPad. To get staretd, go to Prezi.com, create an account and watch a couple of their easy-to-follow video tutorials. Start small and give yourself plenty of time to become comfortable with the tool before trying it out on an audience. Check out some of these teacher Prezis for more ideas! After pasting in a link, the generator will provide you with a downloadable .jpeg or .png file that can be inserted as an image into a document. QR codes can even be scanned off of a screen during a presentation (you might remember the funny looking barcode at the end of my library orientation presentation). Different apps are available for various cellular devices (Android, iPhone, etc.). 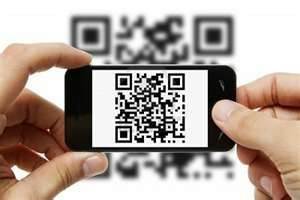 What type of information works well with QR Codes? Online forms, videos, blogs, teacher websites all work well on smart phone devices. You might stear clear from using QR codes on smart phones for pages that include a lot of visual information or text as they can be difficult to read on a phone unless the site has a mobile version. QR codes work great when integrated with instruction to respond to surveys and forms or to quickly link students to class pages and frequently used sites. One school last year posted their individual class websites on each teacher door at open house. Parents scanned the QR code and automatically received contact and class information to their devices. Check out this article from t.h.e Journal showcasing one high school science teacher’s experiences with integrating mobile device technology and QR codes into his classroom. We are continually bombarded with information delievered in innovative and engaging ways. Rather than rowing against the tide, let’s harness a few tools to help our students be more critical consumers who can create new solutions and innovations as a result of the unlimited amount of information at their fingertips. Have you used a Prezi or QR code in your class? We’d love to hear about your successes and struggles in the comments below! This entry was posted in apps, information technology, presentation, tech tuesday, VESTED.